Versatile supply linear diffuser for wall, ceiling or sill installations. Adjustable air discharge pattern for horizontal or vertical directions provides draft free comfort for both heating and cooling. Designed for efficient air distribution at cooling differentials up to 30° F.
SLADs can be used for combination supply/return or return only. Continuous runs with active and inactive sections. Extruded aluminum construction with attractive, durable finish. Pattern control designed for easy adjustment of horizontal or vertical discharge. Arctic white outer flanges, center tees and end caps. Flat black pattern control element and adjustment vanes for clean architectural look. Available in four slot widths, 1/2", 3/4", 1" and 1-1/2". Available in single piece lengths from 12" to 72". key-ways and alignment strips for exact alignment and clean, neat appearance. Assembly hardware - duct mounting brackets, alignment strips, end caps, mounting bracket screws - provided as applicable. 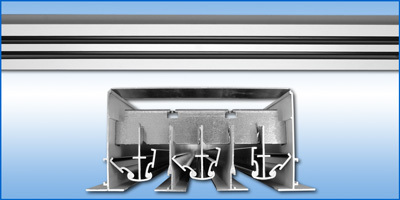 Frames available for surface, lay-in T-bar and 9/16 narrow slot grid systems, and round (spiral) duct. Plenums – insulated or non-insulated. Mitered corners for ceiling or wall applications. Model TBF T-Bar mounting frames. Custom colors (provide paint chip or formulation number).